I was buzzing around the kitchen getting ready to leave for work. My husband was making lunches for our daughters before he would bring them to the bus stop. The girls were sitting at the kitchen table completing their respective packets of worksheets to be turned in that day at school. Then our 4 year old (yes, FOUR year old) dropped a bomb. "Homework is pretty boring, Daddy, isn't it?" I stopped. My husband and I glanced at one another and he raised an eyebrow. I looked at her for a moment thinking, "She's only in preschool." We also have a daughter who is 7 and in first grade. (She inspired my previous post about grading.) Our first grader actually kind of likes homework. She sees each assignment as a challenge, like a puzzle to be solved. 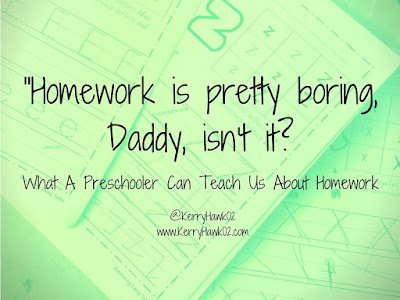 As a result, all of the discussions and activities around homework in our house during our preschooler's little life have been positive. Despite that she came up with her own opinion of homework: Boring. I used my sweet mommy voice to ask her why she thought it was boring. She answered, "I don't like to do this. Why do I have to do this?" A picture of the first page of preschool homework packets sent home this year. The photo of her packets helps tell the story. She doesn't want to practice writing the same letter over and over just because it is the "letter of the week." Writing the same thing over and over is not what she sees her parents or her older sister do. She sees us write words and sentences. So we offer to write a sentence that she dictates and then she copies it in the space below on the paper. That way she is writing her own stories. She is taking her own notes. Her handwriting and fine motor skills have improved, but we have stopped asking her to complete the packets sent home from school. My preschooler is a great example of a learner who is seeking to develop a skill through real world experiences. As a teacher with experience at the middle and high school levels, I'll confidently tell you that adolescents and teens are eager for the same authentic opportunities for learning. I'll also humbly admit that I assigned some pretty terrible homework early in my career. I quickly realized that my students didn't learn much when they found what they are doing tedious or boring. My students and I figured out which academic tasks were worthy of spilling from our classroom into precious family time. Also, from the perspective of a mom who doesn't have enough time with her young children during hectic weekdays, I can tell you what I believe is worthy of being a part of that precious time. What other criteria could I add? 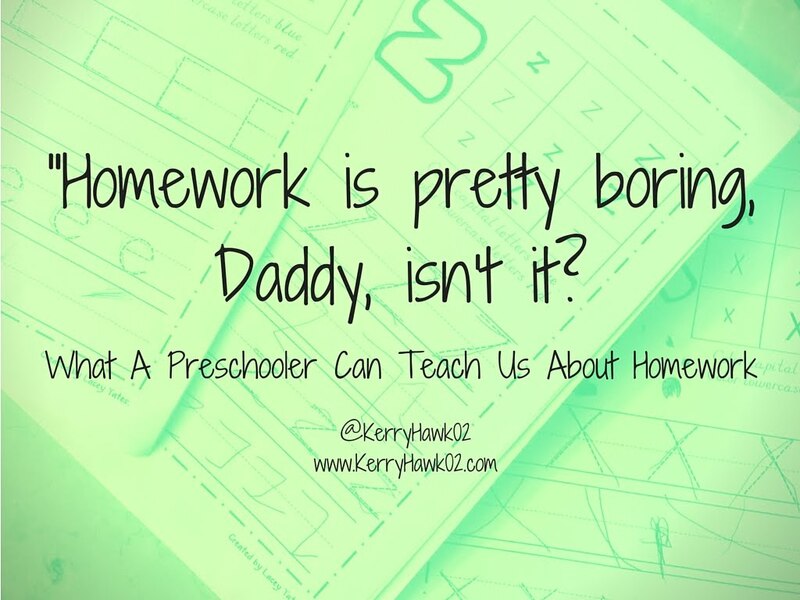 How do you determine whether homework is worthy of impeding on your students' family time or free time? How can we redefine homework?